Depending on which side of the pendulum you ride, hearing the words Back to School can either strike dread and form a pit in your stomach or produce euphoria! I go back to work full-time August 3rd, part-time this week. I should figure out a way to word it better. It doesn’t sound nearly dramatic enough that way. I have been working full-time this summer as the mother of two young children, but August 3rd sees the recombination of full-time work outside the home with full-time work inside the home. My children don’t care for what that means for them. Me? I’m most worried about keeping my house ready for a showing at a moment’s notice. I will get this thing sold! I will admit I had a spring in my step as I headed into school office on my way to work. It is the last week of July and I am preparing for the class I will be teaching next week as well as trying to get my head wrapped around another week out-of-town for work-all sandwiched around picking up my daughter from camp in Michigan, and her 10th birthday. I’m not afraid to admit that life does get easier for me when the kids go back to school in 3 weeks because that at least reduces my mom-guilt and need to be in too many places at once. I am not a mom who has ever cried or thought about crying when school starts. I actually feel kind of bad for those moms who feel that Back to School equals loss or a tear-worthy event. Mom-guilt makes me wonder if it means I’m not as dedicated of a mother as they are. Common sense tells me that I LOVE school and have a hard time imagining anyone not LOVING school. School is such a part of childhood, like losing a tooth or falling off your bike, that it has always just been part of the rhythm of my children growing up. I find it fascinating that there are moms who have parties to celebrate their children going back to school and others who have parties to mourn the same thing. I’m going to be at school having a great time with their children, no judgement attached. The first week of August I am teaching a class for Teachers on Writing Workshop and conferring with writers. The second week of August I am back at Columbia’s TCRWP for a week of intense training in Writer’s Workshop. The third week has me in consulting meetings throughout buildings and with teachers who have willingly given up one of their last free days to meet and plan with me for this upcoming year. What does the year have in store? Everyday Math version 3 adoption in full swing; a Writing Units of Study Calendar that has each grade level having a dedicated 4 and half days to meet before each new unit of study in writing commences; further training of staff in reading assessments; Response to Intervention work-working to get the buildings in-sync and not falling into a cart-before-the-horse trap; Professional Learning Communities throughout the district; Book Studies. And of course all the emergencies that can’t be planned for that crop in the day, week, life of a school. 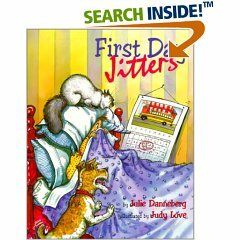 I love to start the first day with First Day Jittersby Julie Danneberg. It’s a great way to introduce the idea to kids that everyone (kid or grown-up) get nervous sometimes. As the story unfolds, many of the stereotypical reasons a kids wouldn’t want to go to school are used. Eventually the principal leads the nervous person to her new class (most students still think it is a new student) only to reveal on the last spread that it is the teacher that has been the nervous wreck. I’ve used it different ways, but last year we had a class discussion about things that they were nervous about at their new school (fourth graders are new to the intermediate school after being at the elementary for kgn through third for our district). We then can go back to that list at the end of the first week to see if the things they worried about have been resolved. 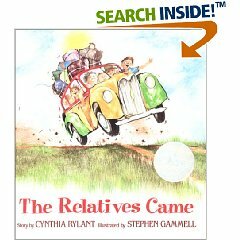 I also like to use The Relatives Cameby Cynthia Rylant the first day to introduce the ideas that things are different when you go to a relatives house compared to your own house, just like rules at school/classroom are different than the rules they might have had at home or at the elementary. Nice springboard into setting class guidelines. 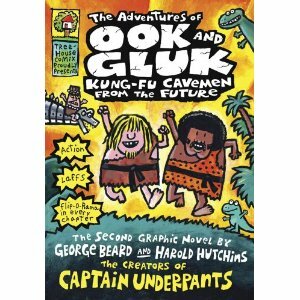 This book also makes a great starting point to inspire an introductory writing sample for students to write about a special time with a relative. What is it about those weeks leading up to school? You should be soaking up the last rays, trying to complete something on your to-do list, or finish reading the last chapter of a thick, non-child (I was afraid adult book could be misaken for something else) book, but NO……..Insomnia, “schoolmares”, waking at ungodly hours in the morning. What does it mean? It must be August with school coming in the next week or two, or three. Some nights it is the dream where students start arriving raring to go, and the room is still a mess as I clean and sort. Other nights it the to-do list for school that wakes me up. The first day of school is so different than other first days. You only have one chance to do the first day right and if you don’t…you might be doomed to bad habits that will drive you bonkers by Thanksgiving. Any tricks you have learned over the years to fight off the back-to-school sleeplessness would be greatly appreciated!